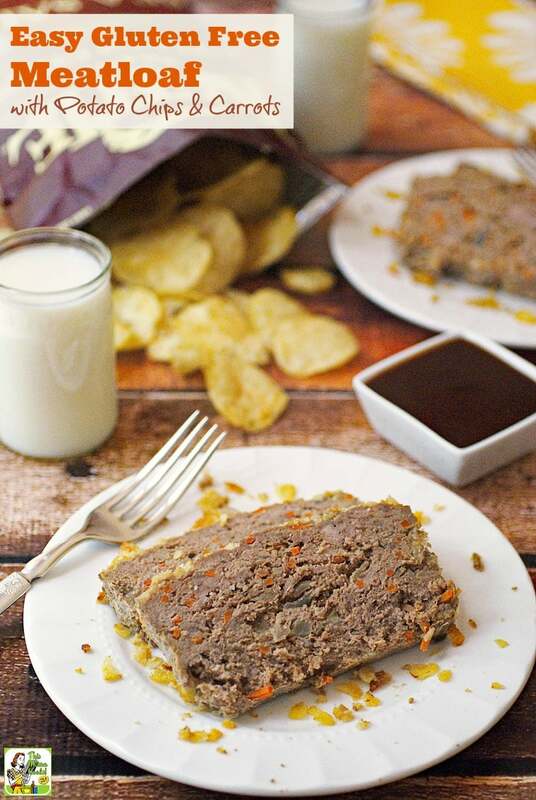 If you want to make a gluten free meatloaf without breadcrumbs, try cooking this easy gluten free meatloaf recipe with potato chips and carrots! At my house, meatloaf is a popular but challenging dish. For years, I had to make it egg-free due to my daughter’s allergies. She’s grown out of her egg allergies, thank goodness, but now we have to deal with me being gluten free and dairy free. Usually, I use gluten free panko in my meatloaf or toast some gluten free bread and make bread crumbs from that for easy gluten free meatloaf. 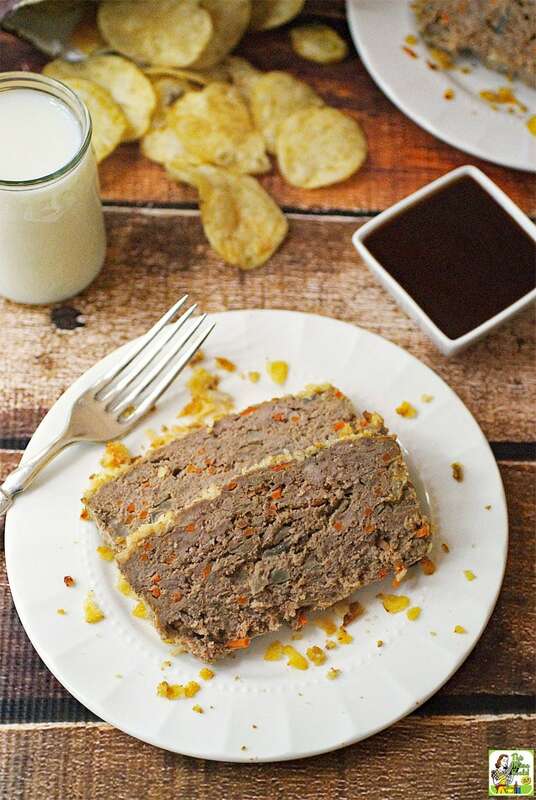 But since it’s college basketball season and we’re snacking on Kettle Brand Potato Chips and baby carrots, I thought I’d take those two ingredients and try a carrots and potato chip meatloaf recipe for fun! I normally try keep junk food out of my house. However, there are certain people around here (ahem) who feel that watching sports on television isn’t fun without a bag of salt and vinegar potato chips. So, when faced with a chips request, I try to find a brand that’s as wholesome as possible. That’s why I buy Kettle Brand Potato Chips. It’s our go-to brand. Inspired by the Kettle Chips and baby carrots we had as sport watching snacks, I thought I’d use both instead of bread crumbs in my easy gluten free meatloaf recipe. I also used crushed potato chips on the top of the meatloaf for added visual appeal. I used Kettle Brand’s Sea Salt Potato Chips, but you can experiment with your favorite flavor when you’re making potato chip meatloaf. I bet Kettle Brand’s Backyard Barbeque, Jalapeño Jack, or Cheddar Beer flavors would turn this into the best gluten free meatloaf ever! 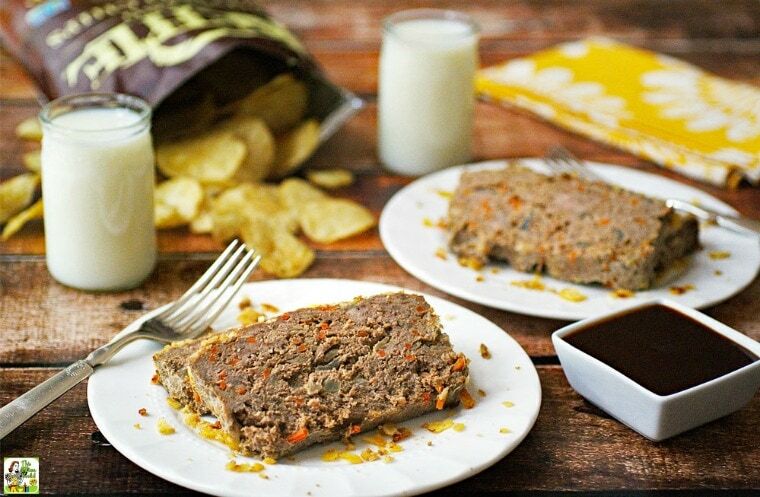 This Mama’s tips for making Easy Gluten Free Meatloaf with Potato Chips and Carrots! To health up this easy gluten free meatloaf, I used lean ground beef and egg whites. (You can also use ground turkey.) I also kept it dairy free by using rice milk. But feel free to use regular milk if you don’t have a food sensitivity to cow's milk. Since I used Stubb’s BBQ Sauce, I served that on the side instead of ketchup. You can also serve this with fresh green beans and some Easy Mashed Parsnips and Chives. And don’t forget, leftover slices of cold meatloaf make wonderful sandwiches! If you double the recipe, you can freeze one loaf for later. Let the meatloaf cool in the pan. Then lift it out and cover completely with foil to freeze. 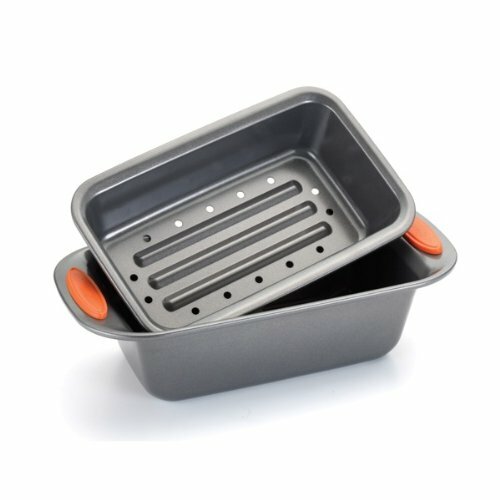 Instead of the aluminum foil, you may want to use a two-piece meatloaf pan that has a perforated, elevated insert so fat can drain away as your healthy gluten free meatloaf cooks. These pans are totally on my Amazon wish list! All three have great reviews but I’m going to get the Wilton Perfect Results 2 Piece Meatloaf Pan. I love cooking with all my Wilton Bakeware. Combine all ingredients (except for cooking spray and 1/2 cup of the crushed potato chips) in a bowl. Mix until all ingredients are well combined. You can use your hands or a potato masher. 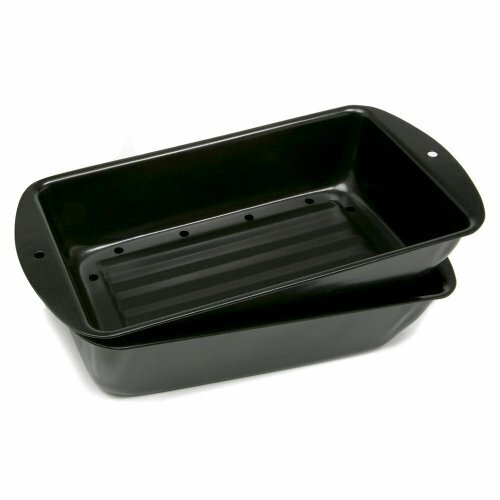 Line a 9x5” meatloaf pan with foil. Spray inside with cooking spray. Place meatloaf ingredients in the pan. Pat down evenly. Sprinkle 1/2 cup of crush potato chips evenly on top of loaf. 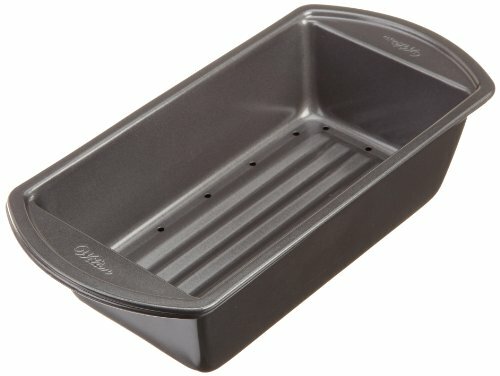 Place meatloaf pan on top of a baking sheet and place into oven. Remove from oven and let sit for 10 to 15 minutes. Gently remove the meatloaf by lifting up on the aluminum foil. Peel foil off of meatloaf, cut into slices and serve. Originally posted on July 9, 2013. Updated with new pictures.